Daniel Obenour, an environmental engineer at NC State, is collaborating with coastal ecologist Hans Paerl of the UNC-CH Institute of Marine Sciences on this North Carolina Sea Grant project. When the team later assessed how well their experimental model had anticipated oxygen levels, they determined their forecast effectively matched observed conditions — and they also found significant impacts on the estuary from Tropical Storm Chris and Hurricane Florence. Alexey Katin is a doctoral student in civil engineering at North Carolina State University who works on the project. This blogpost also appeared in the Spring 2019 issue of Coastwatch magazine. To evaluate the performance of our experimental hypoxia forecast for the Neuse River Estuary, we compared our forecasted bottom-water dissolved oxygen concentrations with observed values. We had forecasted severe hypoxic conditions for July and August relative to long-term averages throughout the Neuse River Estuary. Note the solid black line in Figure 1 below. In comparison, the average observed midsummer bottom-water dissolved oxygen concentrations, which the figure’s dashed blue line represents, was higher than our forecasted estimate, but within the 90% prediction interval, which the figure’s gray band indicates. The prediction interval expresses the uncertainty in the forecast due to unpredictable conditions, such as storm events. However, the average observed dissolved oxygen level would have been lower and even closer to the forecasted value if July measurements had not immediately followed an extreme weather event, Tropical Storm Chris, that mixed the water column of the estuary, temporarily elevating the bottom dissolved oxygen levels. Figure 1. Observed and Predicted Bottom-Water Dissolved Oxygen for May to October 2018 for the Middle Segment of the Neuse River Estuary. Storm symbols indicate when Chris and Florence struck the estuary. In November, we reran the hypoxia simulation using observed daily data for May through October and reconstructed (“hindcasted”) daily dissolved oxygen conditions in the estuary. Note the dotted black line in Figure 1. The hindcast indicated that the estuary was hypoxic, below 2 mg/L, about half the time during midsummer 2018. In addition, the hindcast captured elevated bottom-water dissolved oxygen levels from Tropical Storm Chris and Hurricane Florence. 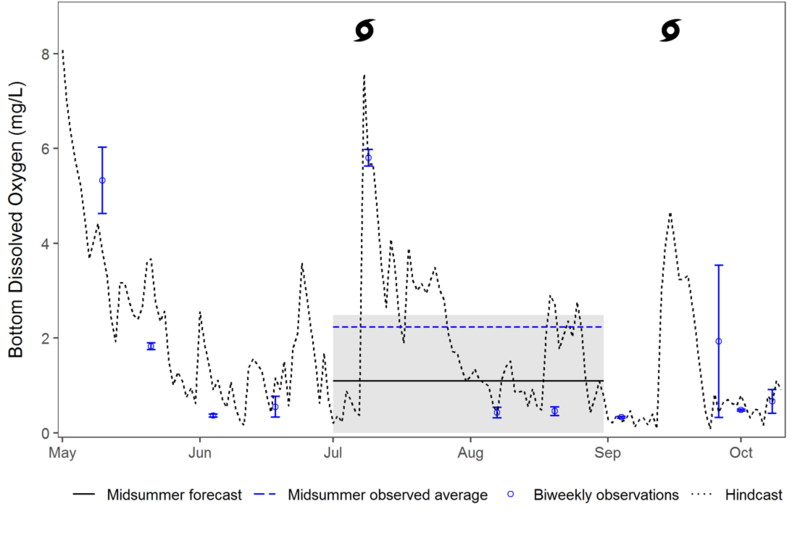 The hindcast also matched summer observations well, as shown by the blue points in Figure 1 — and it supported our forecasted midsummer hypoxic conditions in the estuary. In short, the experimental model we used to forecast oxygen levels this past summer shows great promise as we look ahead. Lead photo: Florence’s late-summer approach. 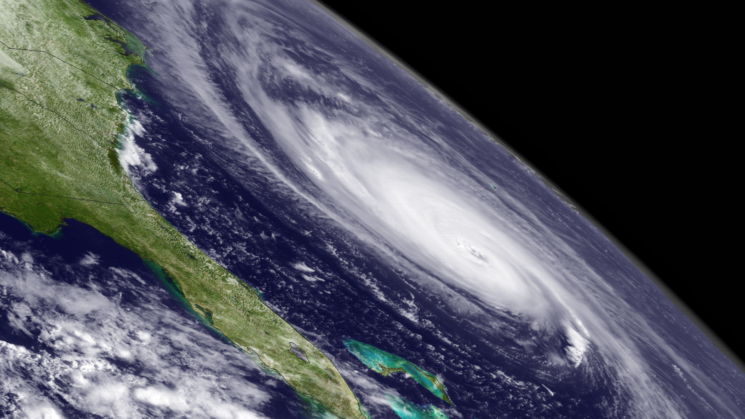 Credit: NOAA.